Border Counties Advertizer 8 January 1919. The death occurred at her residence, Oswestry Vicarage, on the forenoon of Saturday, of Lady Webb, wife of Sir Henry Webb, Bart, Llwynarthen, Cardiff, ex M.P. for the Forest of Dean, and the event has created very sincere regret locally where the deceased lady was most popular. During her residence in the town where until recently her husband commanded the Western Command Labour Centre, Lady Webb was actively engaged in philanthropic work chiefly in the direction of improving the conditions of life of the large number of troops stationed at Park Hall Camp. Here Sir Henry and Lady Webb regularly provided entertainments for the soldiers and in many ways worked to make their period of service as cheerful and attractive as possible. In doing this Lady Webb was continuing useful service carried on in other places where Sir Henry has been stationed since the beginning of the war; two other centres of her useful activity where news of her death will cause much regret, being at Malvern and Leyburn in Yorkshire. 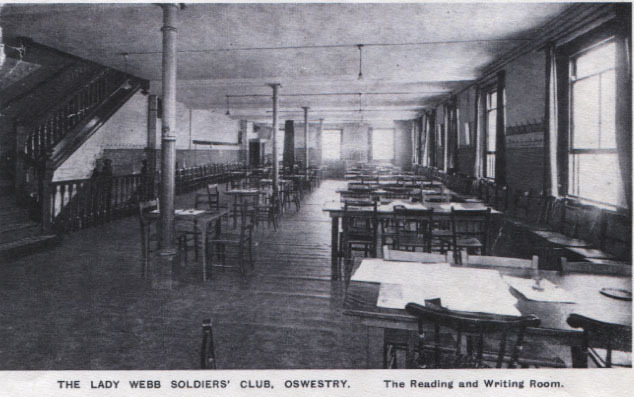 It is some eighteen months since the commodious premises in Oswald Road, Oswestry were acquired by Lady Webb and admirably equipped as a soldiers’ club and institute, and were on the eve of being opened when news came that her son Lieut. T.H. Basil Webb, Welsh Guards had fallen in action near Cambrai. This was an almost overwhelming blow to her Ladyship; and from the shock it caused her she never really recovered, although, with brave fortitude she continued to devote herself, heart and soul to the work of making brighter the lives of the soldiers stationed at Park Hall Camp. The club enterprise rapidly came to be what was predicted for it at the opening ceremony “a home from home” for the men and provided a standing monument to her powers of organisation; for Lady Webb managed the enterprise with great tact and readiness to grasp the requirements of those for whom it was intended, that ensured its success. Sir Henry and Lady Webb in the early days of the war converted their beautiful residence at Cardiff into a Red Cross Hospital and, as such, they carried it on for a time and it is still serving the same good cause. Lady Webb, who took the keenest interest in Sir Henry’s political work, was very active during the recent contest in the Forest of Dean division, her strenuous exertions in support of her husband’s candidature – and she was scarcely absent from one of his meetings – must have put a great strain on her physical powers; and, during the fortnight proceeding her death she was subject to severe heart attacks. On New Year’s Eve her condition became precarious, the best medical skill and attention proved unavailing and she gradually sank and passed away as stated. The deceased was the fourth daughter of the late Mr.W.P.Williams of Cardiff a former editor of the “South Wales Daily News”, her sisters being the Misses Williams of Newnham, Gloucester, Mrs Baugh of Leamington,. Two brothers survive her, Mr Arthur Williams, London and Mr Charles Williams who has recently returned to London after being a prisoner of war at Ruhleben since the day before war was declared between this country and Germany. She was married at Cardiff to Mr (now Sir Henry) Webb in1894 and there were two children, a daughter who died eighteen years ago and her gallant son, whose death has already being mentioned. It is beside her daughter at Tunbridge Wells in Kent that her remains will be laid to rest tomorrow (Thursday), the funeral being taken at 2.30pm.